A major figure in 20th-century music, Feldman was a pioneer of indeterminate music, a development associated with the experimental New York School of composers also including John Cage, Christian Wolff, and Earle Brown. Feldman's works are characterized by notational innovations that he developed to create his characteristic sound: rhythms that seem to be free and floating; pitch shadings that seem softly unfocused; a generally quiet and slowly evolving music; recurring asymmetric patterns. His later works, after 1977, also begin to explore extremes of duration. Feldman was born in Woodside, Queens into a family of Russian-Jewish immigrants. His parents, Irving Feldman (1893—1985) and Frances Breskin Feldman (1897—1984), immigrated to New York from Pereyaslav (father, 1910) and Bobruysk (mother, 1901). His father was a manufacturer of children's coats. As a child he studied piano with Vera Maurina Press, who, according to the composer himself, instilled in him a "vibrant musicality rather than musicianship." Feldman's first composition teachers were Wallingford Riegger, one of the first American followers of Arnold Schoenberg, and Stefan Wolpe, a German-born Jewish composer who studied under Franz Schreker and Anton Webern. Feldman and Wolpe spent most of their time simply talking about music and art. In early 1950 Feldman heard the New York Philharmonic perform Anton Webern's Symphony, op. 21. After this work, the orchestra was going to perform a piece by Sergei Rachmaninoff, and Feldman left immediately, disturbed by the audience's disrespectful reaction to Webern's work. In the lobby he met John Cage, who was at the concert and had also decided to step out. The two quickly became friends, with Feldman moving into the apartment on the second floor of the building Cage lived in. Through Cage, he met sculptor Richard Lippold (who had a studio next door) and artists Sonia Sekula, Robert Rauschenberg, and others, and composers such as Henry Cowell, Virgil Thomson, and George Antheil. With Cage's encouragement, Feldman began to write pieces that had no relation to compositional systems of the past, such as traditional harmony or the serial technique. He experimented with nonstandard systems of musical notation, often using grids in his scores, and specifying how many notes should be played at a certain time but not which ones. Feldman's experiments with chance in turn inspired Cage to write pieces like Music of Changes, where the notes to be played are determined by consulting the I Ching. Through Cage, Feldman met many other prominent figures in the New York arts scene, among them Jackson Pollock, Philip Guston and Frank O'Hara. He found inspiration in the paintings of the abstract expressionists, and in the 1970s wrote a number of pieces around 20 minutes in length, including Rothko Chapel (1971, written for the building of the same name, which houses paintings by Mark Rothko) and For Frank O'Hara (1973). In 1977, he wrote the opera Neither with original text by Samuel Beckett. Feldman was commissioned to compose the score for Jack Garfein's 1961 film Something Wild, but after hearing the music for the opening scene, in which a character (played by Carroll Baker, incidentally also Garfein's wife) is raped, the director promptly withdrew his commission, opting to enlist Aaron Copland instead. The director's reaction was said to be, "My wife is being raped and you write celesta music?" Feldman's music "changed radically" in 1970, moving away from graphic and arhythmic notation systems and toward rhythmic precision. The first piece of this new period was a short, 55-measure work, "Madame Press Died Last Week at Ninety", dedicated to his childhood piano teacher, Vera Maurina Press. In 1973, at the age of 47, Feldman became the Edgard Varèse Professor (a title of his own devising) at the University at Buffalo. Until then, Feldman had earned his living as a full-time employee at the family textile business in New York's garment district. In addition to teaching at SUNY Buffalo, Feldman held residencies during the mid-1980s at the University of California, San Diego. Later, he began to produce very long works, often in one continuous movement, rarely shorter than half an hour in length and often much longer. These include Violin and String Quartet (1985, around 2 hours), For Philip Guston (1984, around four hours) and, most extreme, the String Quartet II (1983, over six hours long without a break). These pieces typically maintain a very slow developmental pace and are mostly very quiet. Feldman said that quiet sounds had begun to be the only ones that interested him. In a 1982 lecture, he asked, "Do we have anything in music for example that really wipes everything out? That just cleans everything away?" Feldman married the Canadian composer Barbara Monk shortly before his death. He died of pancreatic cancer in 1987 at his home in Buffalo, New York, after fighting for his life for three months. For Feldman's notable students, see List of music students by teacher: C to F § Morton Feldman. ^ Feldman, Morton. "Liner Notes." Give My Regards to Eighth Street: Collected Writings of Morton Feldman. Ed. B. H. Friedman. Cambridge: Exact Change, 2000. 4. Print. ^ Vigeland, Nils. "Morton Feldman: The Viola in my Life". Liner note essay. New World Records. ^ Ruch, A, Morton Feldman's Neither Archived 2011-11-23 at the Wayback Machine themodernword.com website, 17 May 2001. Retrieved October 30, 2012. ^ Wilson, Peter Niklas. "Canvasses and time canvasses". Chris Villars Homepage. Retrieved 30 May 2011. ^ Feldman, Morton (February 2, 1973). "Morton Feldman Slee Lecture, February 2, 1973". State University of New York at Buffalo. Archived from the original on 28 June 2010. Retrieved 17 December 2012. Feldman, Morton. 1968. Give My Regards to Eighth Street, Artnews Annual. Included in Give my regards to Eighth Street: Collected Writings of Morton Feldman (2000), The Music of Morton Feldman, and elsewhere. Gagne, Cole, and Caras, Tracey. 1982. Interview with Morton Feldman. In: Soundpieces: Interviews with American Composers, 164–177. Metuchen, New Jersey: The Scarecrow Press Inc, 1982. Available online. Hirata, Catherin. 2002. Morton Feldman. In: Sitsky, Larry, ed. 2002. Music of the Twentieth-century Avant-garde. Greenwood Publishing Group. Revill, David. 1993. The Roaring Silence: John Cage – a Life. Arcade Publishing. ISBN 1-55970-220-6, ISBN 978-1-55970-220-1. Ross, Alex. 2006. American Sublime. The New Yorker, June 19, 2006. Available online. Zimmerman, Walter, ed. 1985. Morton Feldman Essays. Kerpen: Beginner. Feldman, Morton. Morton Feldman Says. Chris Villars, ed. London: Hyphen Press, 2006. Feldman, Morton. 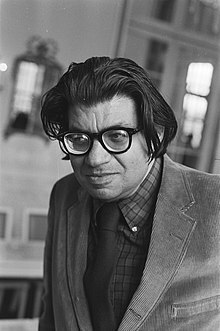 Morton Feldman in Middelburg. Lectures and Conversations. R. Mörchen, ed. Cologne: MusikTexte, 2008. Feldman, Morton. Give my regards to Eighth Street: Collected Writings of Morton Feldman. B.H. Friedman, ed. Cambridge, MA: Exact Change, 2000. Gareau, Philip. La musique de Morton Feldman ou le temps en liberté. Paris: L'Harmattan, 2006. Hirata, Catherin (Winter 1996). "The Sounds of the Sounds Themselves: Analyzing the Early Music of Morton Feldman", Perspectives of New Music 34, no.1, 6-27. Herzfeld, Gregor. "Historisches Bewusstsein in Morton Feldmans Unterrichtsskizzen", Archiv für Musikwissenschaft Vol. 66, no. 3, (Summer 2009), 218-233. "Morton Feldman biography" (in French). IRCAM.